Banksy Choose Your Weapon originally appeared in London, England in 2010. The stark contrast between the man and his dog is the most striking contradiction in this art piece. 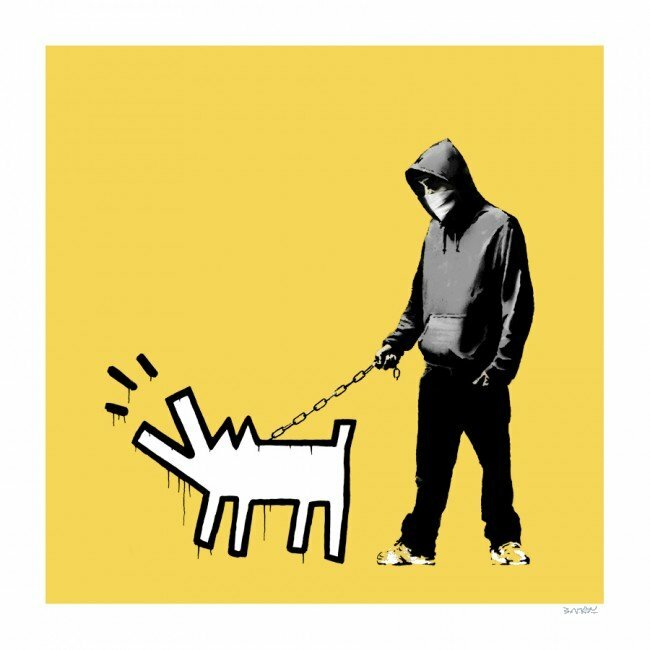 Banksy Choose Your Weapon Keith Haring Dog originally appeared in London, England in 2010. The stark contrast between the man and his dog is the most striking contradiction in this art piece. The man in the art piece represents the disaffected youth that features so prominently in British pop culture. The hooded sweatshirt with the cowl covering the head and bandanna hiding the young man’s face both appear menacing. The dog in the print, chained and barking upwardly, becomes the young man’s weapon.